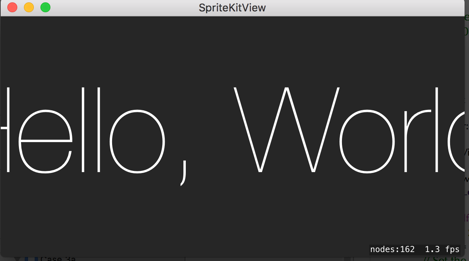 This came out of the strange case of the scrolling SpriteKit View, which did – in the end – work fine (as in, my SpriteKit scene was displaying) and failed when I tried to add interactions to it. 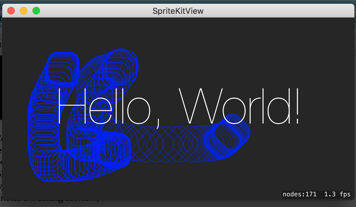 As a result, I went back to the drawing board, played some more with SpriteKit, and ended up with a simpler solution. We build on Apple’s template, so I am not repeating the code here. 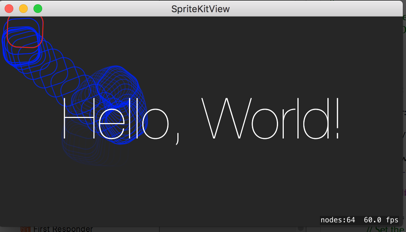 The ViewController presents the SKScene; the connected GameScene.swift defines the interactions (mouseDown, mouseDragged, mouseUp, keyDown). If you want to play along at home, remember to set each scene as the WindowController’s windowContent. Case 2: We implement the exact same settings, only instead of changing the class of the viewController’s view to ‘SKView’, we replace it with an SKView in Interface Builder. Note that the icon changes and that additional settings turn up in the ViewAttributes. We connect both view and skView outlet, and find that nothing happens. In other apps with a similar setup, this did not lead to any interaction, but quite frankly, ‘interaction’ at 1.3fps is almost indistinguishable from no interaction. This was an incredibly frustrating setup. 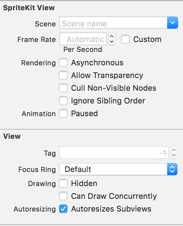 If you use the SKView provided by IB (which has the SpriteKit View settings exposed), it will not work without specifying the Scene, but it appears that the SceneEditor makes the scene incredibly slow. Case 4: As in Case 3, but setting the ViewController’s class to the default NSViewController. means that both the Scene.sks file (for providing the static elements) and the Scene.swift file (for providing the interaction) are used. 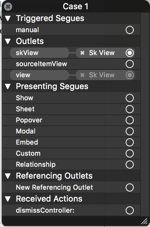 If you present a scene by setting the SKView’s scene to Scene.sks, only the static elements – with a different scaleMode – are displayed; all of the interaction goes missing. Working hypothesis: there’s a conflict here. Case 5: We’ll go through the whole thing again with the same ViewController and a new scene. Create Case5Scene.sks via File -> New, create Case5Scene.swift as a subclass of SKScene, and in the CustomClass Inspector of Case5Scene.sks, set its class as Case5Scene.swift. Build and Run: this scene behaves exactly as the previous iterations. Case 6: Let’s duplicate Case 3 with our new scene and see what happens. Hypothesis: We get the glacial frame rate again. Reality: yup. Starting at 1fps and moving up to 1.3 fps. Case 6a: What happens if we comment ‘present view’ out from the ViewController? We retain the framerate which makes moving the square positively glacial, but now placing new nodes is also slowed down: the application feels sluggish overall. And with that, I call it a wrap. 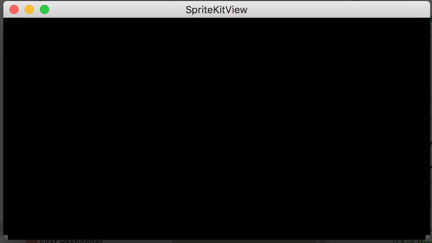 We now know that the culprit in not being able to set up working SpriteKit scenes in IB is the inbuilt ‘SKView’ class, and that the way around this is to use a custom View (NSView), change its class to SKView, and use ‘presentScene’ in the view controller. 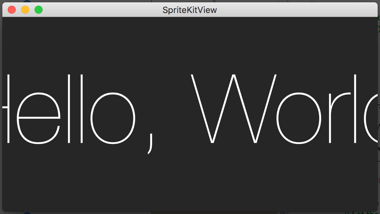 This means I can update and simplify the ScrollView tutorial, which in the first instance used an SKView created in code and went through a lot of ‘this doesn’t display anything/doesn’t allow interactions’. Since using sks files works (as long as you downcast an NSView), and sks files are lovely for laying out initial scenes, I will opt for using them in the future.